Funny I should mention that I cloned a Lagunitas brew just yesterday. Announcing a new 250 bbl brewery140 characters (or less) at a time. The brewhouse’s location will be “18th & Rockwell, Chicago” and bigger than most of the craft breweries in Chicago combined. At 250 barrels, it will be 5x the size of Goose Island’s operation in Chi town. 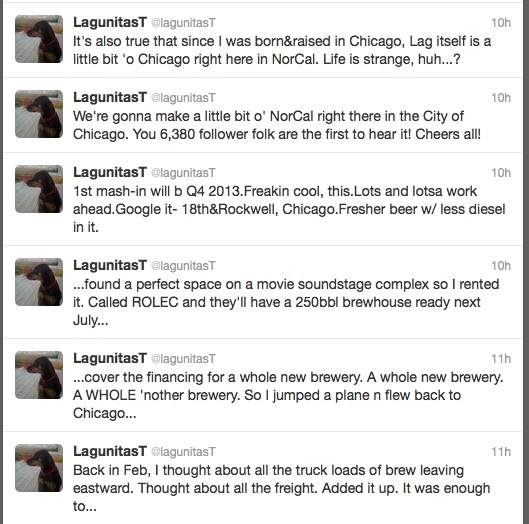 Lagunitas Brewing to open new brewery in Chicago | Beerpulse.com.